Harlequins brought an end to Saracens unbeaten start to the season with a 17-10 victory at the Twickenham Stoop. 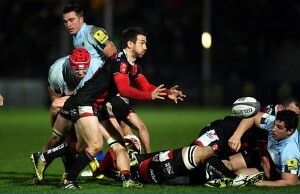 The loss is Premiership champions Saracens first this season and their first in over six months. Harlequins powered to a 17-0 lead by half time after tries from Tim Visser and Charlie Walker. Saracens worked their way back into the game with a try from Richard Wigglesworth straight after the break and a penalty from Ben Spencer cut the home side’s lead. 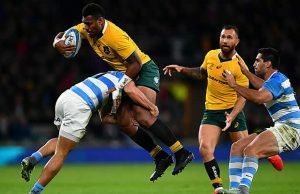 Harlequins lost former Wallabies captain James Horwill to a yellow card but they held on for the victory. Harlequins: Brown; Walker, Hopper, Roberts, Visser; Swiel, Care (capt); Marler, Buchanan, Collier, Merrick, Horwill, Robshaw, Wallace, Chisholm. Replacements: Gray, Lambert, Sinckler, Twomey, Ward, Dickson, Jackson, Alofa. Saracens: Goode; Ellery, Bosch, Barritt (capt), Wyles; Lozowski, Wigglesworth; M. Vunipola, Brits, Du Plessis, Itoje, Hamilton, Rhodes, Wray, B. Vunipola. Replacements: George, Barrington, Figallo, Brown, Spurling, Spencer, Tompkins, Gallagher.